Unlike in other games like Skyrim, where hunting is just a nice way to pass the time and collect some resources for selling or decorating your home, in Red Dead Redemption 2 hunting is serious business. Here hunting is an essential part of the game; it keeps your camp fed, allows you to create talismans that buff your stats and keeps your health up. Most importantly, though, most of us just want to complete that elusive Master Hunter Challenge. Of course, hunting isn’t as easy as simply pointing a gun at an animal and shooting. No, Red Dead Redemption 2 takes its hunting very seriously, meaning you’re going to have to put some serious time and effort into learning and honing the skill. Unfortunately, though, the hunting tutorial you’re provided with in the game is brief and doesn’t really provide you with any real idea of how to hunt efficiently. Red Dead Redemption is absolutely stuffed with animals – 178 different kinds in total – meaning that no matter where you are on the map, it’s likely that there’s an animal nearby to hunt. So, really, finding animals isn’t a problem, the real issue is finding the specific animal you’re looking for. To help with this, Arthur (your character) will draw an animal on your map when you discover one in the wild. So, to get started in hunting, your best bet is to simply jump on your horse and go for a ride. The more animals you discover, the easy it will be later on when you’re looking for specific animals. Like hunting would be in reality, you can’t simply find an animal and start shooting wildly. This will ruin the quality of the pelt. Instead, you need to stalk your prey first. To do this, use your binoculars. These can be used to study and stalk your prey from afar, without scaring them off. The game mechanic will bring up a ‘study’ prompt when you have an animal-centred for a few seconds. From there, you will be able to see information about your prey; including the quality of the animal. You can also use your binoculars as a way to spot animals that are hidden. Scan the landscape slowly, if the ‘study’ prompt appears in the bottom righthand corner, you can assume there’s an animal there. If you’ve seen or studied the animal previously, you’ll also be told what you’re looking at – even if you can’t see it yourself! This also works while in Eagle Eye and in targeting mode, if you’ve studied an animal before and added it to your Compendium, you will be told what animal you’re looking at and the quality of that animal. If you’re only looking to practice shooting or hunting, you can simply just go for any old animal you see. However, for the most gain in the game, or when you’re looking for a particular animal, you’re going to want to use you Eagle Eye ability and track your hunts. 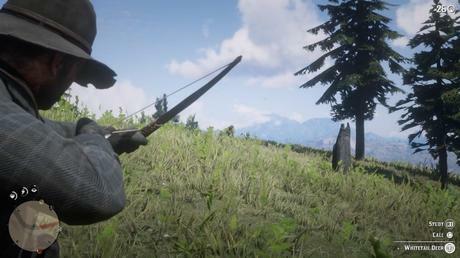 Unlike your Dead Eye ability, which will slow time around you in a fight, the Eagle Eye mode will highlight animals that are close and show you the trails of where animals have been. So, like a real hunter, you can follow these trails and stalk your prey. Again, if you’ve studied the animal before, you’ll be told the type of animal and its pelt quality. You’ve no doubt noticed that there’s been a lot of emphasis on the quality of a pelt, and that’s for a good reason. To be an efficient hunter and get the most from your kills, you need to aim for a good quality pelt. 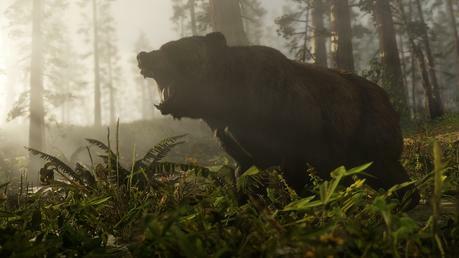 In Red Dead Redemption 2, every animal has a quality rating and once you’ve studied that animal, their quality will be shown along with its species at the bottom right corner while you look through your binoculars or aim with a weapon. These will be listed as poor, good or perfect. Aiming for perfect is important, as these will earn you a lot more money than a poor carcass if you choose to sell the meat to a butcher. When you skin your animal, a perfect pelt will provide you with more materials – such as meat or feathers – than a poor rated animal would. You’ll also want to aim for a perfect kill too – through the neck or as a headshot – too. This isn’t always easy when an animal keeps their head down to graze, however, you can press square/x (depending on your console) to call out to the animal. This will cause the animal to look up, giving you the chance to get your headshot. Beware, calling out too much will spook the animal and it will run. Weapon choice is incredibly important for your hunts, after-all if you shoot a frog with a shotgun, there’s not going to be much left. So, no matter how perfect your pelt was, to begin with, if you use the wrong weapon or shoot the animal badly/too much, the quality will soon fall. A small animal will be picked up and placed into his satchel. A moderate animal will, rather disgustingly, be skinned without a knife or tied to the side of your saddle. A medium or large animal will need a knife to skin and will be placed on the back of your horse. A massive animal cannot be lifted by Arthur and will need to be butchered on sight. Small animals like squirrels will need a small weapon. Ideally, you should use a bow equipped with small game arrows. You will need to craft these yourself from an arrow, shotgun shell and flight feather (which you will need to hunt too). Moderate animals like rabbits are best killed with the Varmint Rifle. You will need to buy this weapon from the gunsmith. Medium animals like beavers have more options than other categories of animals. Here you can use throwing knives, bows, repeaters, rifles and sniper rifles. Of these, a repeater will give you the best shot of a perfect kill. Large animals also have a few options, such as rifles, bows and sniper rifles. For added help, if you want to use a bow and arrow, you can add poison to your arrows. Overall, rifles are the easiest to kill with here. Massive animals are pretty hard to kill in the game. If you want that perfect kill, you will only achieve it with a sniper rifle or, at a push, an improved arrow. If you’re struggling with a perfect kill, even with the right weapon, fear not – practice definitely helps. There are a few items that you either craft or buy, though, that will help you in your hunting endeavours. This can be especially useful if you are after a particular animal for a challenge. There are three main items that can be used to help your hunting, these are; Herbivore Bait, Predator Bait and Cover Scent Lotion. The Cover Scent Lotion does exactly what you might expect – it covers up your scent! When you’re in Eagle Eye mode, you can see your scent and where that scent is wafting (such as if the wind blows it). By using this item, your scent will be masked, making it easier to track and kill your prey. Baits are also pretty simple, they can be placed and will attract animals to them. To use them to their full potential, choose the placement wisely. You’re going to want to place your bait in a clearing with little cover for an animal to hide. It’s advantageous to have higher ground with cover for yourself while you wait for an animal to appear. All these items can be bought at the general store or crafted yourself. Keep in mind, though, baits aren’t for everyone, as they can be unpredictable and you will need to wait around a lot, which can be tiresome for some. The simplest of ideas, you can eat your kills! These can be made into provisions for your travels by cooking – or as the game calls it, crafting – them at a campfire. To make money, your kills can be taken to a butcher. You’ll find these shops in most of the towns in the game. The amount of cash you get, though, will depend on many factors. For one, a carcass is worth more than just a pelt, some animals have a greater value in certain regions, perfect quality will be favoured over poor and the animal needs to be fresh. Practising perfect kills and selling to a butcher for cash is a great way to increase your skills and riches at the same time. If you’re feeling charitable, you can donate your kills to the Pearson’s butcher table in camp. These kills will be turned into provisions for the camp, and the rest of the animal can be used for camp and satchel upgrades. One of the best ways to make use of your kills is to turn them into trinkets and talismans. These can be crafted from certain animals, and will give specific stat boosts. To do this, visit fences within certain towns, but you’ll need to complete the ‘Spines of America’ mission first. Be prepared! If you’re going to be on the road, even if it’s not specifically for hunting, make sure you’re equipped to take on a kill, as you never know what rare animal you might come across. Keep an all-rounder gun, like a repeater, handy and if something does cross your path, you can take a shot. Use your horse. Hunting on your horse gives you an elevated position from which you can shoot, just remember to keep your horse at a walking speed to prevent too much noise. If your prey does get spooked, though, by being on your horse you’ll have the means to chase it down. Eagle Eye has been praised for helping track your prey, but you can also switch to Dead Eye to help get your kill too. This mode will slow time, allowing you to get a better shot in rather than ruining your pelt with multiple shots. This can also be useful if your prey is trying to run away. Keep track of your kills. It can be easy to go on a killing spree, thinking of the cash you’ll receive. But remember, if you’ve already got one bear on the back of your horse, you can’t add a second. What you can do, though, is switch to a weapon suitable for a small or medium animal, as these can still be transported. Often, you can get a shot on your prey but it will try to run. Instead of panicking and firing off multiple shots – that will ruin your clean kill – it’s likely that your prey will collapse and die nearby. Look at your minimap, a white (unaggressive prey) or red (aggressive prey) paw will show their location. By now you’re armed will all the basic knowledge of how to hunt effectively. All you need to do now is to get on your horse and get the practice in. And remember, the more efficient you become at shooting bears and deer, the better you’ll become at shooting all those pesky cowboys too! Are Amazon Employees Listening to Your Conversations?